Last week I had perhaps the greatest set of wines I've ever had at a single meal, and considering the freebie meals I get invited to, that's saying something. But this time I was paying, along with six of my friends, so the budget wasn't unlimited. It was a special occasion, so we splurged on one name-brand: a DRC La Tache, but we bought a vintage (1992) that wasn't considered a great one. One of my friends was Doug Cook, who wine geeks know as @ablegrape. We pawed the wine list and obsessed over it, preventing our other friends from getting food for a long while. But in the end, other than Doug's Gattinara and my DRC, we gave the sommelier, the estimable Brad Dixon of Bern's Steakhouse, nearly carte blanche to impress us, albeit with a bottle price limit (DRC excepted) of about $150. I'm not going to bore you with tasting notes, which if they were accurate recitations, would be something like "Mmm. Wow. Heaven smells like this." Yes, DRC really is that good -- but so were the others. I probably shouldn't write a post at all, frankly, because I was there to drink and celebrate, not take notes and pontificate. But when we got the final bill, I was astonished at how cheap the meal ended up being. And the reason is simple: our idea of great wine isn't the same as most of America's. 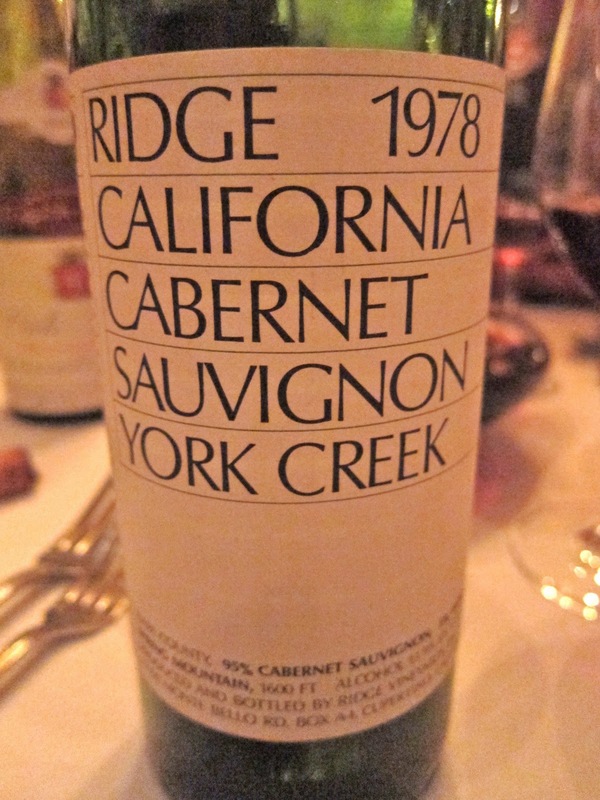 The couple across from us had a corporate Cabernet Sauvignon: a good Napa Valley wine, one that I like, from a near-current vintage. It cost more than the 1974 Chateau Rayas. If you throw out the DRC, you could have the first seven wines on our list for far less than the price of one cult Napa Cabernet. If you include the DRC, you could have all eight wines for less than the price of a current-release first-growth Bordeaux. I could probably write some sort of cultural statement. But you know what? You just keep right on valuing wine that way, America. Harlan Estate and Hundred Acre are worth seven bottles each of 1964 Côte-Rôtie. And if you really want to splurge, I hear Screaming Eagle's nice. Blake - when I read a good wine list I always get a chuckle at the pricing on the sucker-born-every-minute, er... I mean, whatever-the-market-will-bear pricing on some current wines. What will these currently overpriced wines be priced at in 20-30 years, compared to the 20-30 year old wines you had with your meal? The bigger question is - will anyone still want to drink them years from now? Not to be crass, but could you give some prices if you remember? Doesn't look like they have a list posted to their site. Curious what bottles like these go for in restaurants. I don't really order much wine when dining out. Anon: Not a crass question, but I really didn't take notes; I wasn't planning to write anything. I only know exactly what we drank because I did take photos. I do know that none of them save the DRC cost more than $185/bottle, and a few were under $100. Interesting, sounds like a deal to me. 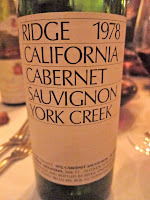 Would like to try that old Ridge York Creek. Dammit. That settles it. I HAVE TO GET TO BERNS. This is killing me. What a great lineup. And Happy Birthday, by the way.